Last week, I was fortunate to teach a class on various ways to spin hand-dyed braids for the Kansas Alliance of Weavers and Spinners (KAWS) 2017 conference in Lawrence, Kansas. In preparing for the class, I pulled together a number of resources and added some of my own experiences and experiments into the mix. 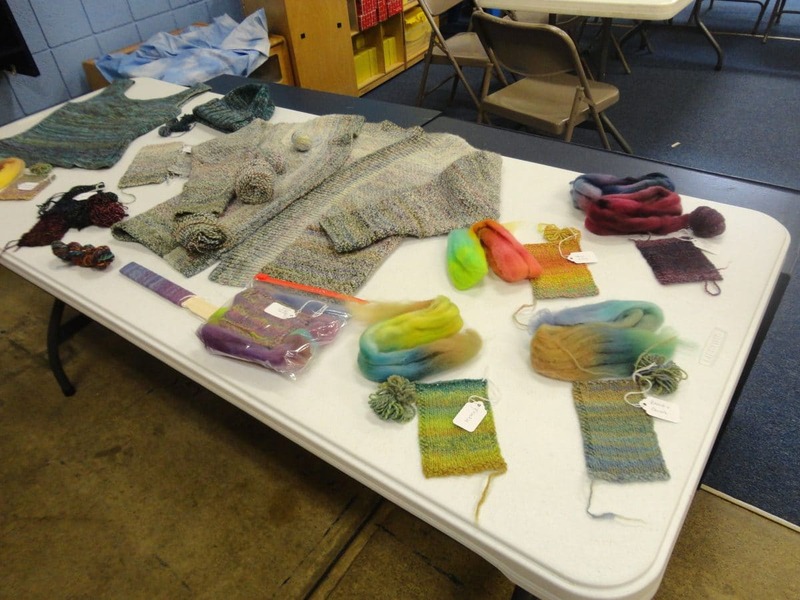 I got together with my friend Deb Waggoner of Two Windows Dye Company, and we spent a companionable afternoon of dyeing for the class. Part of my plan was for spinners to be able to replicate in miniature some of the techniques, like fractal, that normally span an entire braid. This required bands of 3 or 4 colors in an 18" length of roving – not something you generally find. Deb had everything ready for me to get stuck in. I wanted to use a range of colors outside my go-to hues, so there would be a lot of variation. I certainly accomplished that part of the goal (but didn't expect the neon yellow-green that seemed to get brighter every time I looked at it)! Next up was spinning and knitting samples of all the techniques I hoped we would be able to pack into 2 hours, plus a few for show and tell. Between that and creating the handouts, I refined some of my original ideas. Trying to figure out how to clearly explain a concept to others can be a bit tricky, and you have to be even more concise when putting it in print in a handout! I decided to share some of those resources online, and you can find them on the Color in Spinning > Resources page. 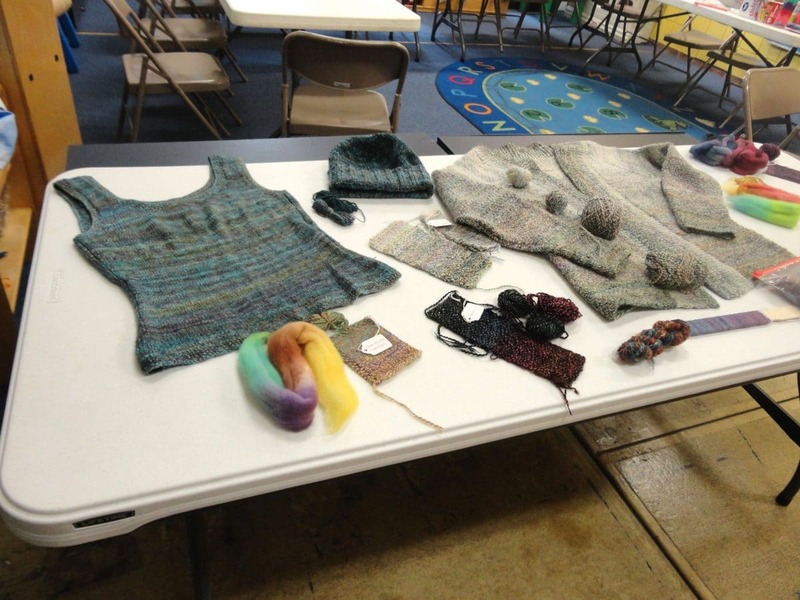 I didn't get any pictures of the class in progress, but did snap a couple of the table with swatches and garments all laid out. When the time was up, we hadn’t gotten all the way through. As a matter of fact, we didn’t even get to the second bobbin, much less plying to see the finished effects. But hands-on classes rarely go as planned, and that wasn’t even necessary for a successful learning experience. All of the students enjoyed the time focused on making informed choices about their spinning, and said they learned things that they would try on their own. 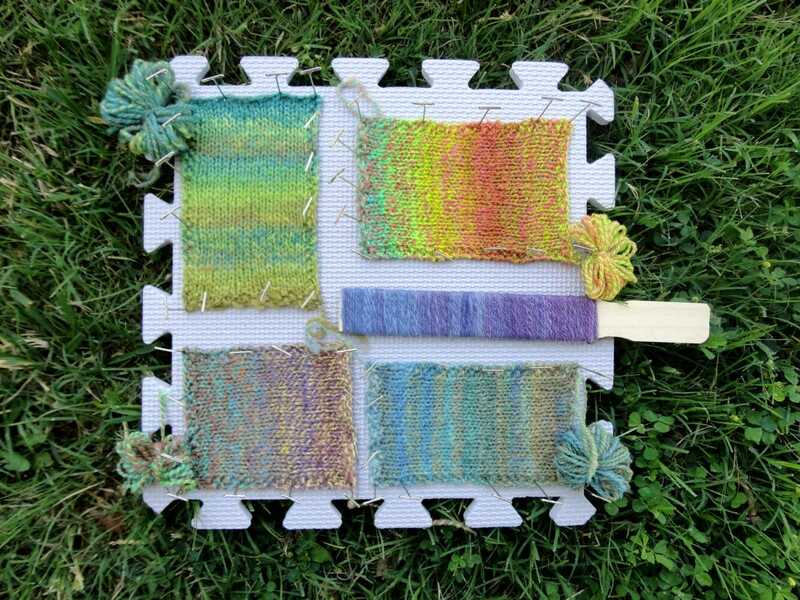 And I know one thing for sure – if you ever want to make spinners happy, send them home with pretty wool to play with! P.S. – In future posts, I’ll show you the swatches individually, and tell you how to do them yourself, so stay tuned!